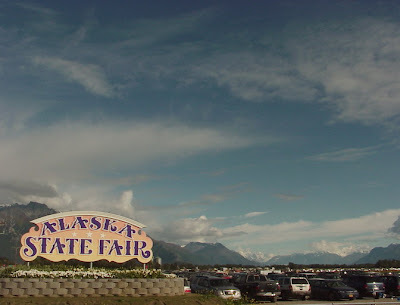 As part of my plan to conquer the universe, we're off to the Alaska State Fair today. I look forward to the fair all year, and the ASF is the best there is. Food, fun, and for a change it's not raining, what could be better? Hope it was a great day with moose burgers and elk hotdogs, or whatever they serve up there. Here, for our Great Geauga County Fair, we have demonstrations of cow milking, and in the next booth, whole-milk milk-shakes. Yumm. And some of the best spiced jerky (cow, venison, or buffalo) I've ever had.